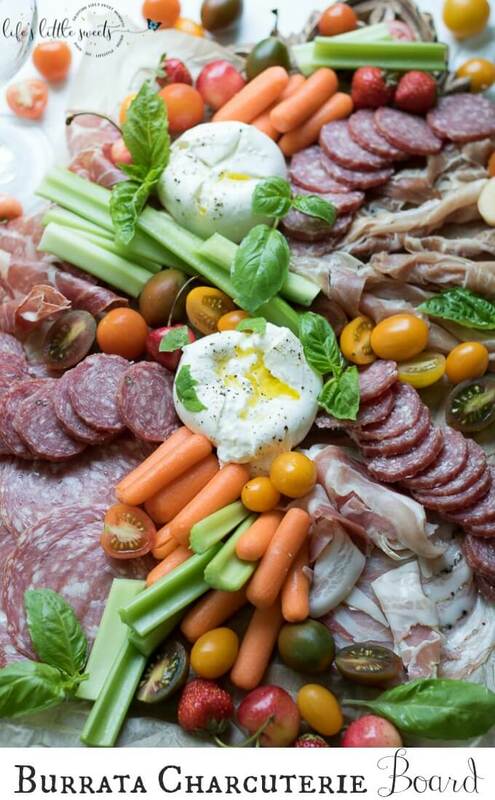 Burrata Charcuterie Board - The Perfect Summer Appetizer! 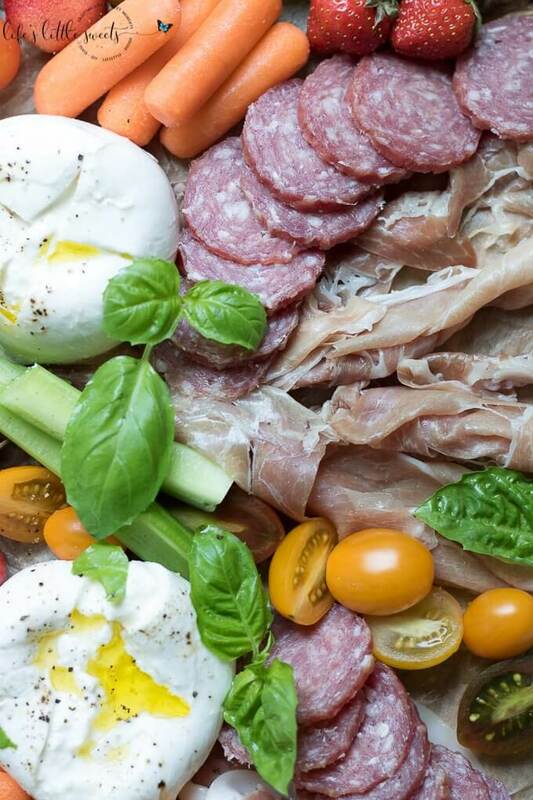 This Burrata Charcuterie Board comes together with Burrata (young Mozzarella) and Charcuterie meats, like hot Capocollo, Milano Salami, Prosciutto, Pancetta and Calabrese. 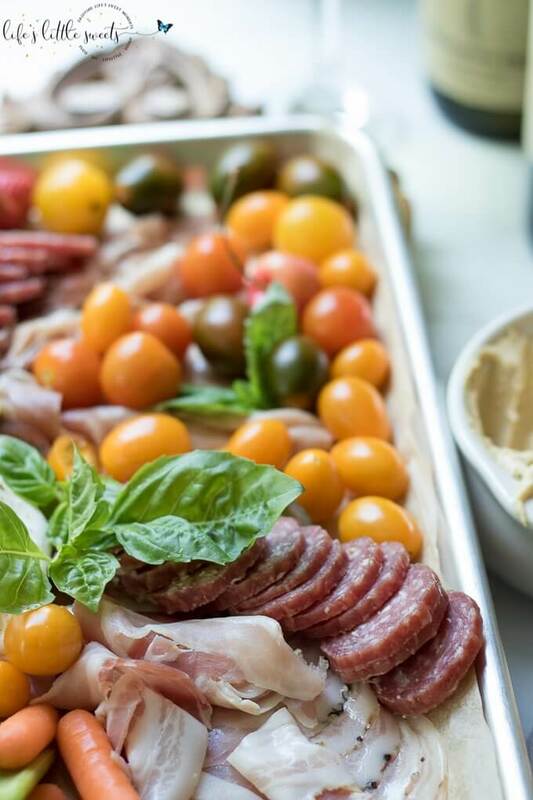 It also features hummus, seasonal fruit, basil and fresh vegetables like baby carrots, celery and cherry tomatoes for dipping. 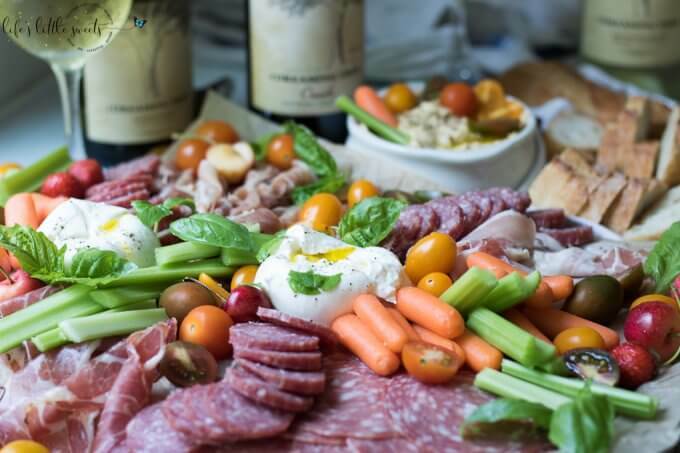 This appetizer board recipe is easy to put together for entertaining and pairs well with Dreaming Tree Crush, Sauvignon Blanc and Chardonnay wines. 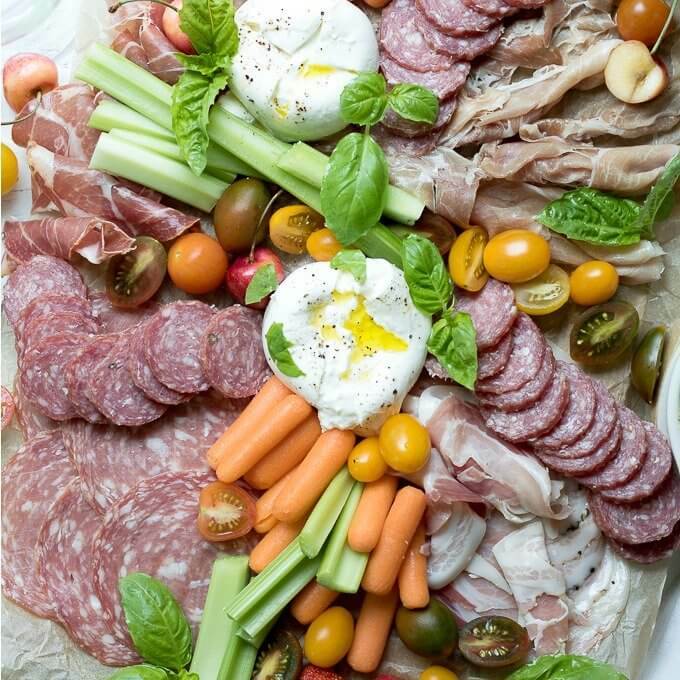 Hi Everyone, the tastes of Summer are all here in this Burrata Charcuterie Board! 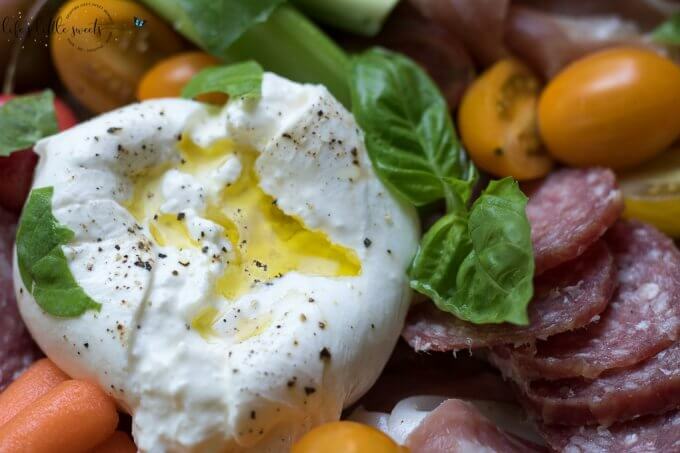 Burrata (young Mozzarella) is so nice for spreading and dipping. I drizzled the burrata with extra virgin olive oil and seasoned it with some pepper (Kosher salt optional). 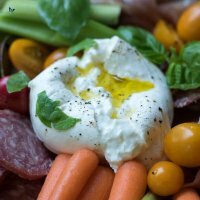 The burrata is fresh and light cheese which goes with the mixed variety of cherry tomatoes and fresh basil that I included. 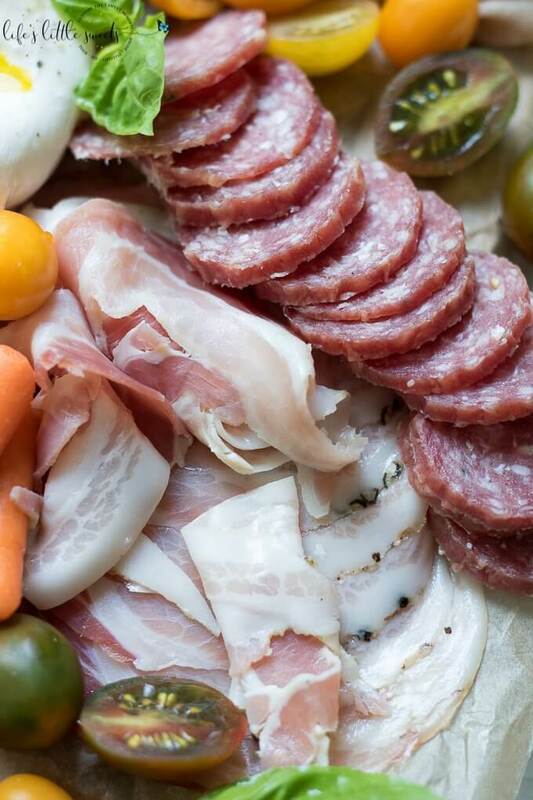 I’ve assembled some favorite Charcuterie (a French word for any dry-cured, smoked or cooked meat) meats like hot Capocollo, Milano Salami, Prosciutto, Pancetta and Calabrese. I chose some sliced celery, baby carrots and a variety of cherry tomatoes (which are technically a fruit!). 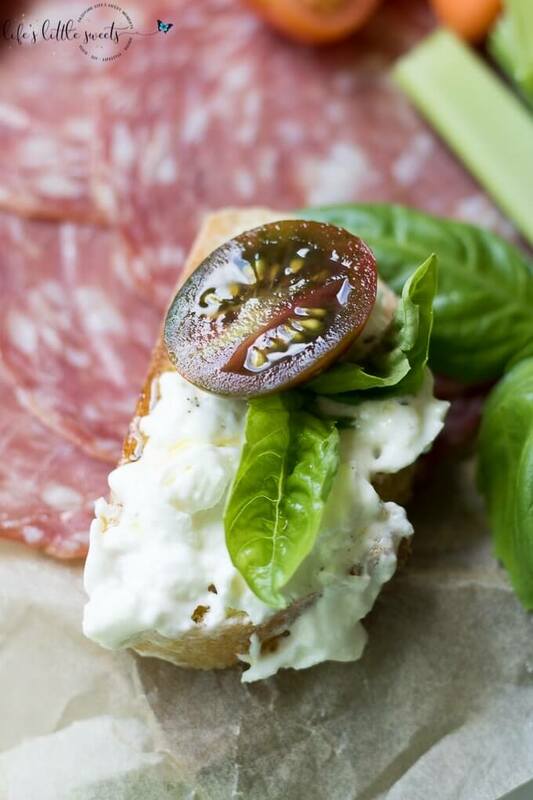 I included fresh basil to garnish and top the buratta because Mozzarella and basil are a match made in Heaven! For sweetness, I included season fruit like cherries and fresh picked strawberries. 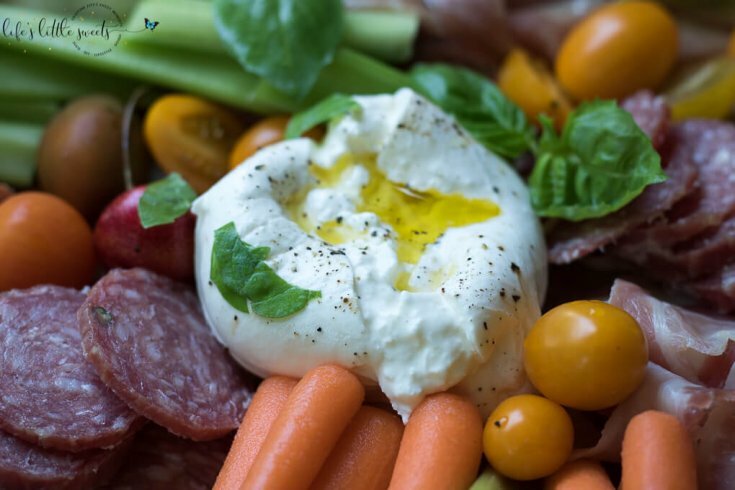 The great thing about this Burrata Charcuterie Board is that you can customize it to your tastes and what is seasonally available. I also included hummus for dipping the veggies in or spreading on sliced baguette bread. I chose to have sliced baguette bread because it’s substantial and pairs nicely with the charcuterie meats and absorbs the burrata and the hummus well. Alternately, you can also have crackers or pita chips too. 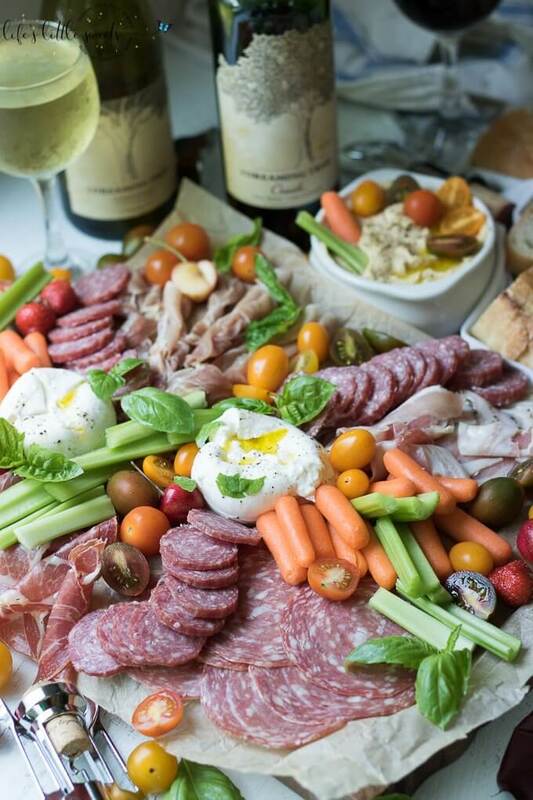 I paired this Burrata Charcuterie Board with Dreaming Tree Wines. 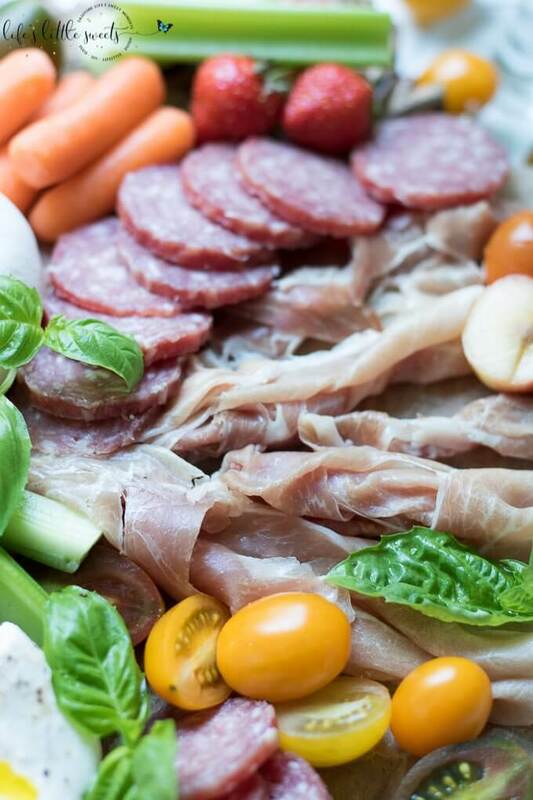 The charcuterie meats pairs nicely with The Dreaming Tree Red Crush. 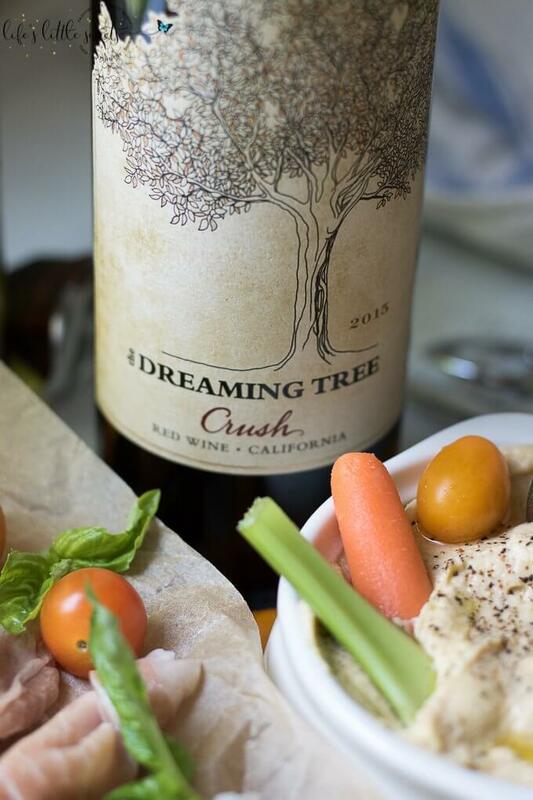 I found Dreaming Tree Crush, Sauvignon Blanc and Chardonnay wines at my local wine store here in New Jersey but you can also find it at your local grocery store or supercenter. I love the beautiful hand-drawn look of the trees on the wine labels. The Dreaming Tree wines have that perfect balance of price point and quality. 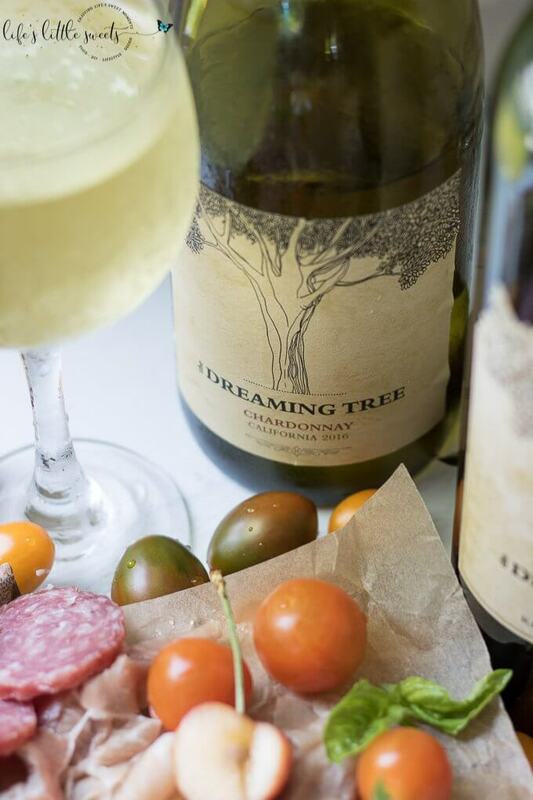 Dreaming Tree wine is exactly the kind of wine that pairs nicely with small bites as well any any Summer BBQ or gathering food. Wine pairings, I used Dreaming Tree Crush, Sauvignon Blanc and Chardonnay wines. 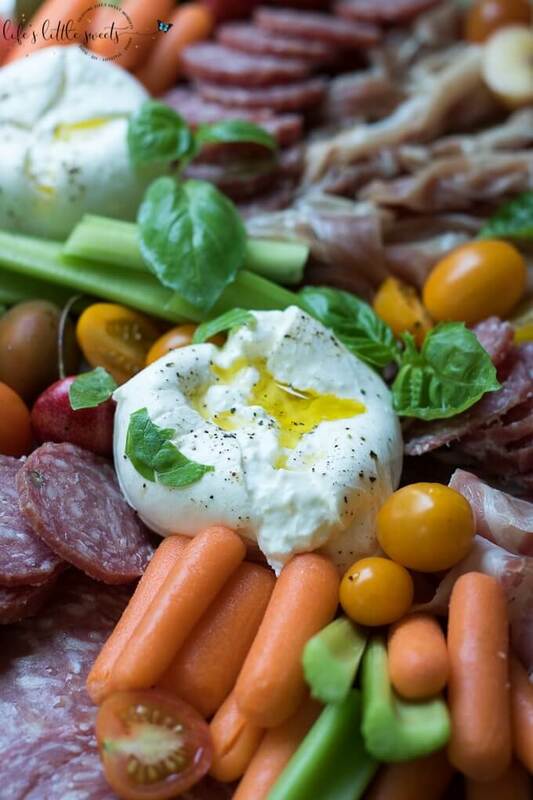 This Burrata Charcuterie Board comes together with Burrata (young Mozzarella) and Charcuterie meats like hot Capocollo, Milano Salami, Prosciutto, Pancetta and Calabrese. 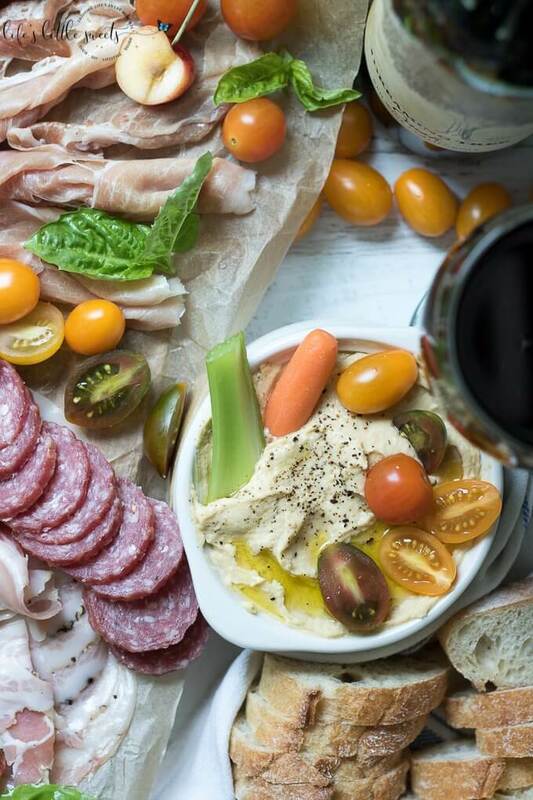 It also features hummus, seasonal fruit, basil and fresh vegetables like baby carrots, celery and cherry tomatoes for dipping. 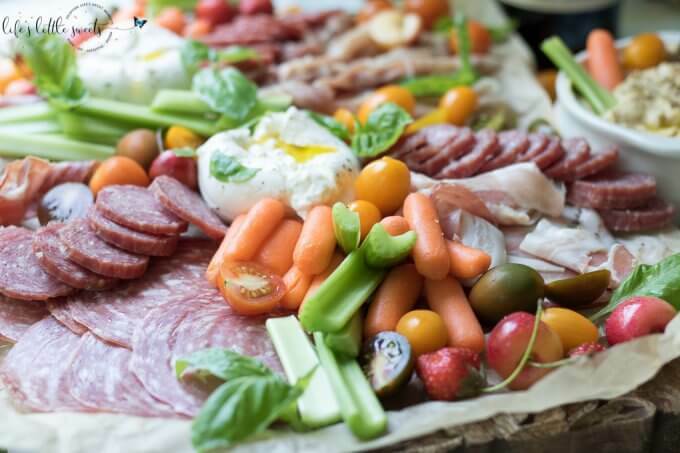 Lay out a large sheet of parchment paper on a rimmed aluminum baking sheet or large cheese or cutting board. (this keeps the ingredients and oil from messing up your cutting board and makes for easy cleanup). 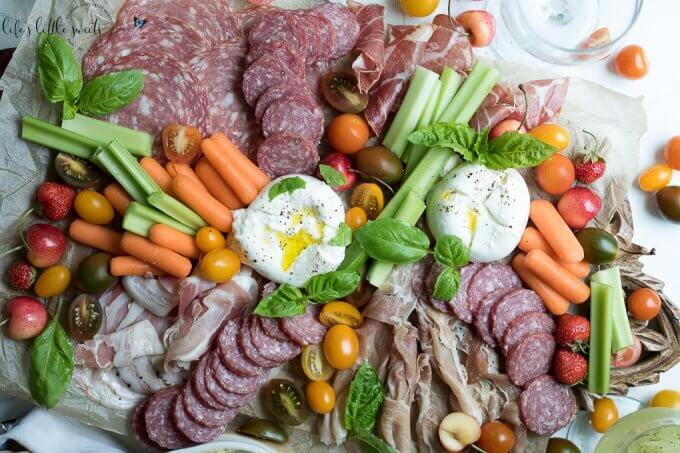 Arrange the burrata, charcuterie meats, vegetables, fruit on the prepared surface. Slice and "x" in the buratta and spread open, then drizzle the olive oil on top and optionally season with fresh ground pepper, if you wish. 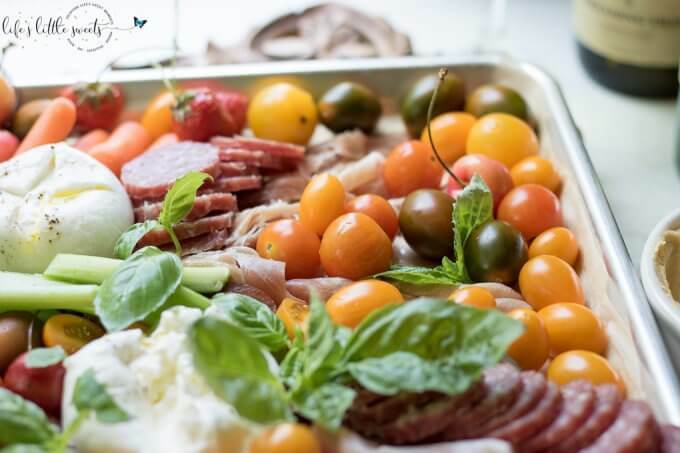 Garnish with fresh basil and serve paired with Dreaming Tree Wine, enjoy! You can visit the Dreaming Tree website, here. 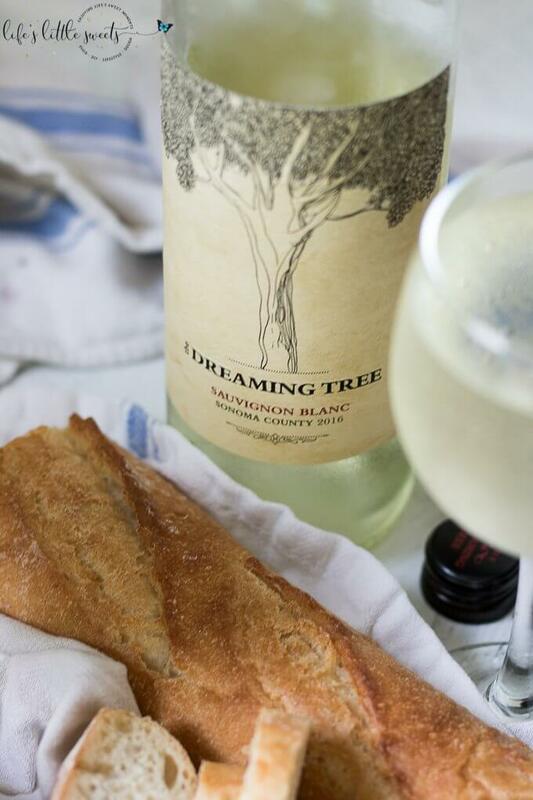 You can find The Dreaming Tree wine at your local grocery, drug or supercenter store, here.